3DNA Dektop, çok güzel bir masaüstü uygulaması. Ne yapar pekiyi? Alıştığımız masaüstümüzü bir eve dönüştürür. Biz o evde gezer dolaşır, gerçek tablolara fotolarımızı koyar, müzik setinde müziklerimizi dinleriz. 3DNA is a 3D desktop application that will enhance and improve the way you work with Windows and the Web. You can choose from different 3D Add-on Worlds to explore and customize with 100’s of themes and skies for an immersive and entertaining desktop. 3DNA works by overlaying the wallpaper area and easily lets you toggle between your 3D and 2D desktop with the click of your mouse. The 3D Worlds also have toys to play with and integrated 3D games. You can move around easily, or simply teleport to different areas when you want to launch applications, open folders, speed-surf dozens of Web sites, or play music. 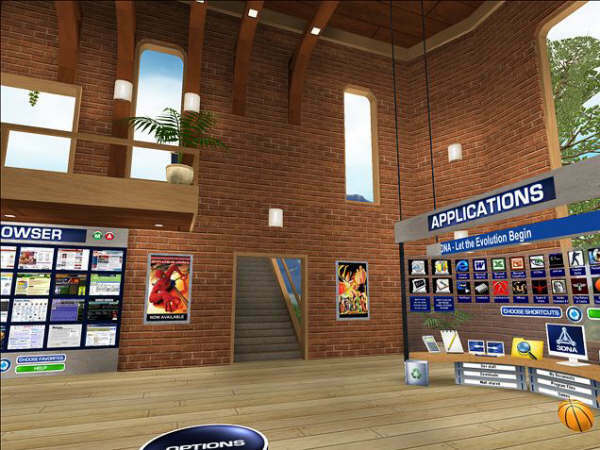 Personalize each 3D World by hanging your digital photos on the walls by simply dragging them onto the picture frames. Within each World you have various areas to create links to your folders, files, and programs. 3DNA will even scan your system to create a custom set of links to get you started. Once you have selected the World you like, you can download additional user-created themes and skies or create your own to share. The interface is intuitive, and there’s an optional Tutorial World that walks you through the product.